The hype surrounding a game before its release doesn’t make the actual finished product once it’s out any better or worse. Despite that though, if a game is made out to be the greatest game ever by people before it comes out, and it’s anything less, many consider a letdown. If no one notices a game and it ends up being good, many say it’s exceeded expectations. Both of those are the same game looked at from two different points of view, both of which are solely in the mind of the person making those prejudgings. Neither of those affect the actual quality of the game, as once it’s released it’s the same game no matter what expectations one had of it. 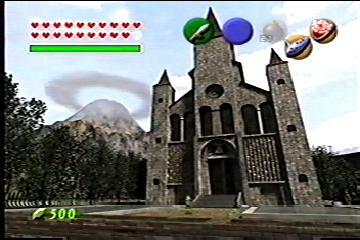 Was The Legend of Zelda: The Ocarina of Time the greatest game of all time when it was released? Is it the greatest game of all time now? Both of those are opinions left up to an individuals taste, how much one likes other, completely separate, games. I personally don’t think it was the greatest game ever at any point in time, but, that doesn’t take away any from the fact that this was, and still is, a great game, just as much today as the day it came out. A marvelous game, with vast landscapes to explore, a variety enemies to fight, unique people to talk to, a changing landscape, spanning over years of time. The fighting is fairly straightforward, but with a variety of approaches. You have a sword and shield you can use, various long-distance weapons, a magic spell or two, and your wits. Get up close to an enemy, lock onto them, jump side to side, flip out of the way of their attack, lunge forward and stab them with your sword. Sneak up on an enemy from a distance, take careful aim, and hit them with a shot, startling them and giving you an opening to run up and attack. Stand in the middle of a group of enemies and let loose with a spell, hitting all of them at once. Once dispatched, the enemy may yield a rupee for use at a local shop to buy a potion or item, a heart to restore your life, or a bottle of magic to replenish your supply. The land is centered around a main “hub” area, with various other areas branching off to the side. As you venture across the land, the sun passes in the sky overhead, sets, and slowly night falls. In the night, you may encounter different people in towns, different shops may be open, and the enemies may begin to gather around you. The rooster will crow and dawn breaks, bringing with it a new day of exploration. Throughout the course of the game, you will explore dungeons, fight bosses, collect items, and travel not only through land but through time. As you travel though time, people will change, areas will become available, and new items will be at your disposal. You will be required to find items, figure out how they are to be used, solve puzzles in some areas, progress, explore, and conquer. Rolling hills as far as the eye can see. Cascading waterfalls. Towering mountains. Running rivers. See something off in the distance that looks interesting? Make your way over and check it out. The entire world surrounds you, and is there for you to touch, experience, and explore. Everything is crisp and clear, although there are some cases of blockyness, and the sun glaring against the “camera” can be a bit annoying (not that looking into the sun would be a good idea in real life either), but, overall, an absolutely beautiful land. Each area has different music associated with it, music flows into each other as you move from one area to another, and just the tones of the music will bring your mind back to the area where that music was originally found. Ok, so the “classic Zelda” theme isn’t in the game. While it would’ve been nice to have that somewhere, some change is always nice too, and the music that is there is great on its own. The sound effects are very nice, the clanging of metal as your sword hits an enemy’s shield or the crack of bones and splitting of flesh as you make contact. The gentle running of the river or the loud roar of a waterfall. The crow of the rooster and the grunt of a monster. Hearing Navi say “Hey! Listen!” a hundred times can get a bit annoying though. Over the course of the game you build up a collection of different Ocarina songs which have a variety of effects, and you’re free to mess around and make whatever kind of music you like with it as well. You’d never have guessed, but, you’re trying to save Princess Zelda and rescue Hyrule from destruction at the hand of Ganondorf. If you’ve played any of the previous games you’d probably guessed as much before playing, and even if you’d never played a Zelda game, most of the plot is laid out for you right away. So, if you’re playing the game hoping for a surprise ending, you’re in for a disappointment there. Along the way though, there are a few twists and turns. Nothing earth-shattering or wildly unpredictable, but still, it’s a bit of variety. As you go through your journey, you’ll run into many people with a number of different small stories behind them, and, as you pass through time, you’ll see how those people have changed. Again, nothing thought-provoking, but fun nonetheless. All in all, if you’re playing this game hoping for a deep storyline, you’re not going to be too happy, but, there is enough there so that you are paying attention. Much of the combat in the game is done using the “Z-targeting” system. 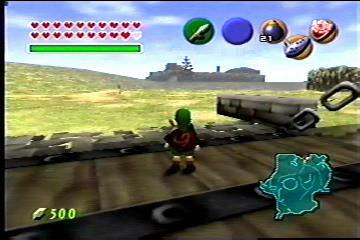 When one gets near an enemy, Navi will fly over it, and pressing Z makes a cursor appear around the enemy, and one’s view is now focused on the enemy. You can sidestep, back up, or charge, all with the screen centered on the enemy. Pressing Z again either switches to the next enemy (if there’s one nearby), or returns the view to normal. Pressing Z when no enemies or other things to focus on are nearby causes the camera to be focus from behind you directly forward. While most of the land is flat, in many of the dungeons there are pillars and platforms one must move between. Jumping is done via an “auto-jump” system, that is, there isn’t a “jump” button, one just runs up to the edge of a platform and you automatically jump, the length and height of the jump being determined by how fast you were going when you reach the edge. This system isn’t perfect, as it can be a bit frustrating when you want to drop down a hole and it keeps making you jump, or you want to push a block and instead it has you jump on top of it. It is fairly intuitive however, and after a bit of playing you really don’t give it much thought. The first time through, the game will probably take around 15-20 hours, and following times through the game will probably take about 10 hours. There are a number of things that one doesn’t need to do in order to beat the game, such as the collection of some items or the finding of small hidden areas, but, there aren’t any real “side-quests,” so, once you beat the game, whether you want to play through it again depends on how much you really want to be thorough with the game, as there’s nothing huge to find by playing through more than once. That said, despite there not being any specific reason plot/discovery reasons to play through more than once, it still is very fun to play through many times, and as one figures out the puzzles from previous times playing, one can focus more on exploring. If you think you’re just going to play it once, beat it, and be happy, not feeling any urge to go through doing extra exploring or collecting solely for the sake of exploring and collecting, that your only goal is to play through the game and see the ending, you could probably beat this game in a rental and be done with it. Unless that’s absolutely set in stone as being the case however, I would certainly recommend buying this game. Again, while your expectations and opinions may vary, I didn’t expect this game to be the greatest game ever, I didn’t think it was when it came out, and I still don’t think it is. That doesn’t mean I don’t think this is still right up there among the top games ever though, and just as much fun to play today as it’s ever been.